Steve Shaw, Julian Dyke, "Pro Oracle Database 10g RAC on Linux: Installation, Administration, and Performance"
Real Application Clusters (RAC) and the Grid architecture are Oracle's strategy for scaling out enterprise systems to cope with bigger workloads and more users. 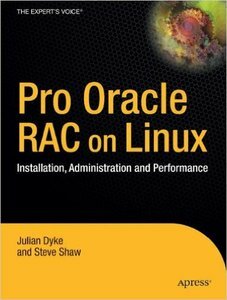 Many books limit themselves by conceptualizing and theorizing about RAC technology, but this book is the first to portray implementing and administering an Oracle 10g RAC system in a Linux environment. This book features basic concepts underlying Linux and Oracle RAC, design strategies, hardware procurement and configuration, and many other topics. The RAC-specific technologies described include configuration of the interconnect, OCFS, ASM, Cluster Ready Services, and Grid Control. The Oracle features RMAN and Data Guard are also discussed, along with available hardware options. The authors include practical examples and configuration information, so that upon reading this book, you’ll be armed with the information you need to build an Oracle RAC database on Linux, whether it is on a single laptop or a 64-node Itanium cluster.